All Lawrence Slickers are hand crafted from the finest raw materials. The quality of design and manufacture makes them a pleasure to use. 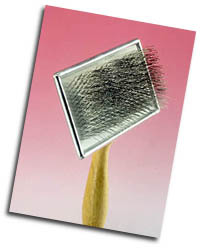 Slicker brushes are intened to be used so that the wire pins do not scratch the skin and cause brush burn. This is why the Tender Care range is of such a light construction so that the groomer gets good feel from the brush. 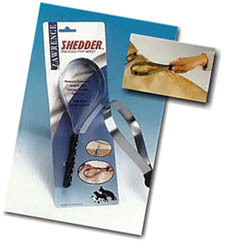 For short coated breeds, slicker brushes should not be used – instead use the Lawrence Hound Gloves with natural fibre brush-pads. 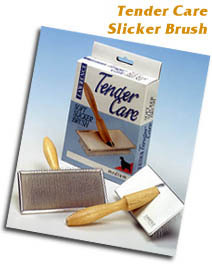 The “Tender Care” soft slicker brushes are specially designed for gentle grooming. 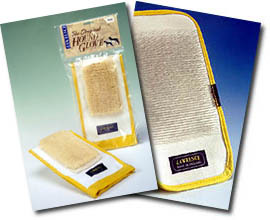 With a lightweight aluminium construction and a soft cushioned pad, Tender Care are especially suitable for fine coated breeds as well as younger or older animals whose coats may require delicate attention. Tender Care slickers are available in Tiny, Small, Medium and Large sizes. The Tiny Tender Care is also useful for grooming around the faces and delicate parts of larger breeds. The Tender Care “302” has pins made from 100% garde 302 stainless steel.The additional softness of this wire as well as total resistance to water makes it ideal for use after shampooing. 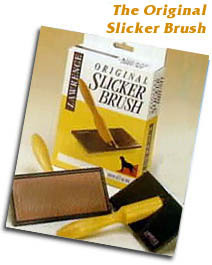 Firm pin slicker brush ideal for thicker and coarser coats, from Terriers to German Shepherd dogs. A universal curved ‘slicker’ especially useful for styling and undercombing. Well made in high grade polypropylene. 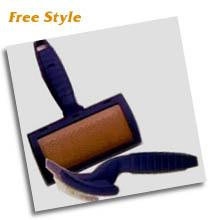 The best soft slicker brush available, combines strength with softness. A favourite for all gentle grooming and great for older dogs and puppies.